The "Original" Gaucho Knife with "Gaucho" etched in the blade- a big brawny 10" overall steak knife with wood handle and rounded blade from Admiral Craft. Its blade is from 400 series stain-free, high-carbon steel and is hollow ground for trouble-free edge maintenance and fast re-sharpening. 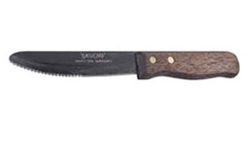 The Gaucho Knife is one of the most widely recognized steak knives in the food service industry. The Gaucho is known for its superior blade and workmanship. Dishwasher safe. Sold by the dozen. Adcraft has been a leading manufacturer of restaurant equipment and supplies since 1952. In those 60 plus years, with superior customer service and innovation, Adcraft's product line has grown to include more than 2000 quality commercial kitchen products. We have proudly distributed these products for 24 years.